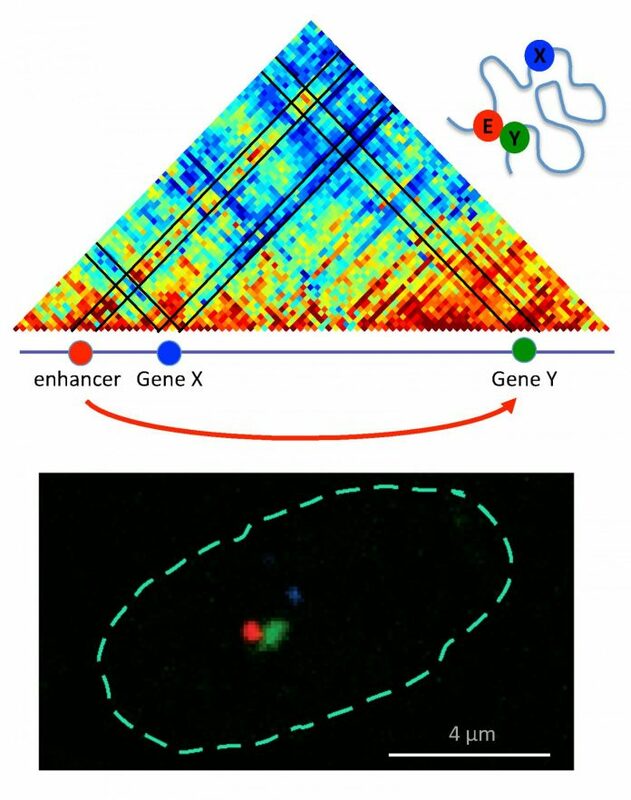 The new technique called Genome Architecture Mapping, or GAM, helps to identify gene contact regions. This method involves flash-freezing tissue or cells, then cutting thin slices of individual nuclei. The tiny amount of DNA within each slice of the nucleus is then sequenced, and the team deploys a mathematical model, named SLICE, to identify “hot spots” of increased interaction between strands. The model then looks at the frequency with which different genomic regions appear in the slice to infer information about the relative positions of genes and regions, called enhancers, that activate them. “This is made possible by filtering out random encounters from real interactions using mathematical methods,” added co-senior study author Mario Nicodemi, Ph.D., professor of physics at the University of Napoli. In the new study, the investigators applied the method to mouse embryonic stem cells, hoping it will help shed light on many genes whose activity is disturbed in some very serious diseases. For some disorders, the problem lies within the sequence of a gene, but defects in regulatory regions found elsewhere in the genome can be equally dangerous and much harder to understand. The new data provides a long list of new suspects that can now be scrutinized by researchers. While previous studies have identified two-way contacts, this information does not reveal how often such contacts take place and by implication how important they might be. “They can spot that you and I are friends, but not how strong this friendship is, relative to everyone else,” Dr. Pombo noted. Now, the researchers are able to reliably detect and quantify so-called “three-way contacts” in regions of the genome that are vigorously expressed. But perhaps the most notable advance through GAM is that experiments are based on single cells—whether common or scarce in a tissue—and can track their positions relative to each other within the tissue. Existing methods require lots of cells of the same type, which has made it difficult to study the biology and diseases of rare types. “There is huge potential for applying this in human tissue samples to catalog contacts between regulatory regions and their target genes, and to use that to understand genetic variation and how it might alter aspects of nuclear biology,” Dr. Pombo remarked. Interestingly, some researchers are starting to show interest in using the technique to explore what happens when retroviruses insert their DNA into the genome of a host. Cancer scientists are also keen to create DNA maps of particular areas of a tumor. “By exploiting the unique nature of GAM data, mathematical models can reliably derive such information, opening the way to identify multiple, group interactions that could play a key role in the regulation of genes,” said Dr. Nicodemi.